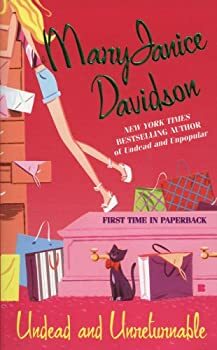 MaryJanice Davidson has been credited with starting paranormal chick lit. As the New York Times and USA Today bestselling author of the Undead series, she won a 2004 Romantic Times Reviewer’s Choice Award and was nominated for the same award in 2005. She also writes young adult literature and nonfiction. MaryJanice Davidson lives in Minnesota. Read excerpts and see her other works at MaryJanice Davidson’s website. Queen Betsy — (2002-2016) Publisher: First Betsy Taylor loses her job, then she’s killed in a car accident. But what really bites is that she can’t seem to stay dead. And now her new friends have the ridiculous idea that Betsy is the prophesied vampire queen, and they want her help in overthrowing the most obnoxious power-hungry vampire in five centuries. Betsy Taylor is having a rough week. First she gets fired, then she gets hit by a car, and then she wakes up in a coffin lined with plush pink satin (yuck!) wearing an unfashionable dress, cheap shoes, and the wrong color make-up. How embarrassing! After piecing together the clues and visiting a minister, Betsy realizes that she’s a very unusual vampire — she’s not affected by crosses, holy water, or sunlight. She does, however, need to drink blood. Betsy is determined to make the most of her death by getting back to her normal life, but she soon discovers that the other vampires in town have expectations of her. Though she tries to stay clear of them, they will not let her rest in peace, and she ends up in the middle of a vampire clan war. 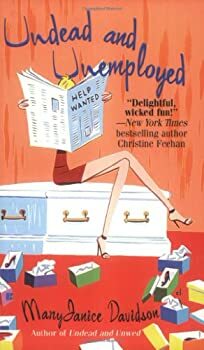 Undead and Unemployed is the second book in MaryJanice Davidson’s QUEEN BETSY series. In the previous book, shallow and too fashionably-conscious Betsy died, came back as a vampire, and managed to kill the vampire queen, which makes Betsy the new queen. Her roommates and friends are determined to make sure Betsy gets the kind of royal treatment she deserves, but Betsy has no interest in fulfilling her exalted role. She just wants to work at her new dream job as a salesperson in the shoe department at Macy’s. But when someone starts killing vampires in her city, her consort Sinclair insists that Betsy do something about it. 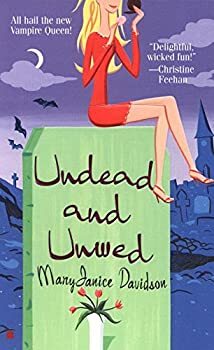 In Undead and Unappreciated, the third book in MaryJanice Davidson’s QUEEN BETSY series, a lot of stuff happens to Betsy — she reads the Book of the Dead and becomes evil for a little while, she hurts her friends, she learns that her stepmother (who she hates) is pregnant, she negotiates with her unionized employees, she discovers that she has a half-sister who is the daughter of the devil, and she admits her feelings for “sin-in-a-suit” Eric Sinclair. Warning: This review will contain spoilers for the previous books in the QUEEN BETSY series. 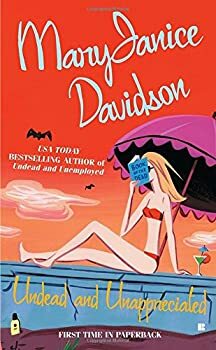 Undead and Unpopular is the fifth book in MaryJanice Davidson’s QUEEN BETSY series. Each of the books in this extremely fluffy paranormal fantasy series is short, silly, and shallow. The only thing that keeps me reading is that they’re quick breezy breaks between more substantial works — something I can read with half my brain tied behind my back. Also, they’re available in downloadable audiobook format at my library. 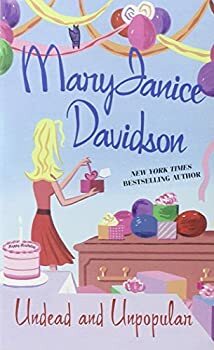 I would have quit if it wasn’t for that, and the fact that I find MaryJanice Davidson’s sense of humor genuinely amusing, and Nancy Wu’s narration exceptional. 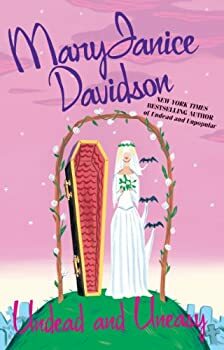 Undead and Uneasy is book six in MaryJanice Davidson’s QUEEN BETSY series, a humorous paranormal urban fantasy. I listened to the audio version which is only 5.5 hours long and is read by Nancy Wu. CLICK HERE TO CHECK FOR MORE JENNIFER SCALES STORIES. Dying for You — (2012) Publisher: Together for the first time, four devilishly entertaining novellas by the New York Times bestselling author prove that there’s not only life after death, but desire too… The Fixer-Upper Cathy’s new home is handsomely furnished — by an amorous male ghost. If only she had something she could… touch. Her neighbor may have a lousy personality, but he does have a perfect body. Now, spirit is about to meet flesh, to Cathy’s delight. Paradise Bossed While traveling in the Cayman Islands, Nikki loses her life in a tragic accident, but has no intention of cutting her vacation short. When a handsome male psychic is engaged to get a grip on Nikki’s spirit, he does more. He finds himself falling in love with her. Driftwood A Cape Cod werewolf agonizes over the death of a woman by his own paw. Well, to be fair, he never really killed her. She’s a vampire. Now she needs his help to kill the bloodsucker who turned her. Witch Way For centuries their families have been embroiled in a violent, irreversible feud. Today, can a witch and a witch-hunter find common ground… without killing each other first? Sometimes opposites do attract. CLICK HERE FOR MORE PARANORMAL ROMANCE BY MARYJANICE DAVIDSON.